Michael McFadyen's Scuba Diving - Long Bay Long Bay in Sydney's Eastern Suburbs is famous, or at least infamous, for its gaol, the Long Bay "Hilton" (aka Long Bay Gaol). It is also well known as the site of the wreck of the MV Malabar and the Malabar Sewage Treatment Plant. Since the opening of the new ocean outfall in 1990, the diving population of Sydney has been able to finally dive the area around Malabar, including Long Bay. At the end of the summer of 1991/92 it was not uncommon to see more than 25 persons diving in and around Long Bay in a single morning. More people have probably dived this area in that first year and a half than in the entire previous 30 years. 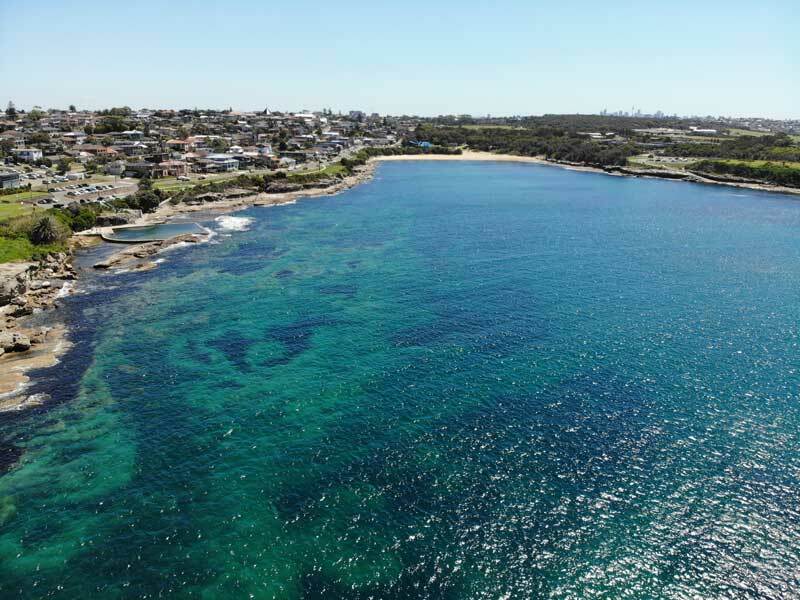 On the western side of Long Bay, just below the clubhouse of Randwick Golf Club, there is an ocean pool that was closed for over 25 years because of the pollution that used to cover the area. This pool is an ideal entry and exit point for an easy day or night dive. It is probably better enjoyed as a night dive. At the intersection of Bay Parade and Howe Street, Malabar, the golf club has a three tier carpark which is an ideal place to park your car. You should be easily able to get a spot on the level closest to the water. After putting on all your gear, go down the steps to the pool and walk out along the edge closest to the water. At high tide, enter the water straight off the pool edge. If it is low tide, drop down onto the rocks and ease yourself into the water. Swim out due east on the surface for about 15 metres until you see a small sand patch before submerging. The depth here will only be about 2 metres but it is an interesting start to the dive. When you reach 9 or 10 metres, you will be in the vicinity of two large rocks. These rocks have a number of overhangs which contain big numbers of bullseyes and eastern rock blackfish. This is a good halfway point. Start off in a south-easterly direction which will take you over a deeper hole (3m). Take the small narrow slit on the south side of the hole and continue in a south-easterly direction. A large rock blocks the slit and then the terrain opens out to a rocky area and then sand. The slit peters out ahead so turn to the east. After about 20 metres you will reach a small drop off and an anvil shaped rock. The sand here is 6.5 metres deep. Follow the edge to the south-east (although in some spots it goes south, east and even north-east) past a large kelp bed. About 40 metres further on you will be 8 metres deep and shortly after see a wide "aisle" between some large rocks. To the east of the rocks the reef meets the sand. Follow the sand edge back to your left. At first it goes in a northerly direction but then it turns to the north-west. All along the edge you will find small overhangs and inlets that hide numerous fish. To your right there is sand that is also home to flathead, stingarees and numbfish. Kelp patches appear regularly and I have seen common sea dragons hiding mixed up in the kelp. The reef disappears in some places, so if you find yourself over sand, head west until you meet rock again. Continue to keep the reef on your left. After you have estimated you have returned back to a point perpendicular to the entry point (depth about 6 metres), turn to the south-west. It is about 50 metres or so back to the entry/exit point. When the depth comes up to 3 metres, surface to check your location. The best exit point, especially at or near high tide is the small channel adjacent to your entry point. Once again, it is probably easier to exit along the bottom, using your hands to assist your progress. Keep to the edge of the pool and turn left into a narrower channel. It is an easy climb from here back to the carpark. An alternate exit point is about 20 metres to the north of the pool. It is a little more difficult to find a good spot to actually exit the water but you will be safe. This dive is able to be able to be done in all but the biggest easterly and southerly seas. Other fish to be seen here include Port Jackson sharks, bream, snapper, yellowtail, whiting and six-spined, reef, rough and velvet leatherjackets, as well as the occasional huge crayfish.